NASA will evaluate SpaceX‘s potential reuse of a previously-deployed first stage launch vehicle on a future mission to the International Space Station, Space News reported Saturday. 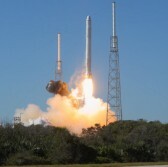 Dan Hartman, ISS deputy program manager, said during a press conference at the space agency’s Wallops Flight Facility that the agency currently performs a review on the Falcon 9‘s use for the SpX-13 mission. He noted SpaceX will also conduct a readiness review to determine whether or not they would refly the platform for the SpX-13 mission slated for launch in December. SpaceX reused a Dragon spacecraft for the SpX-11 mission in June which used a capsule previously launched on the SpX-4 mission in 2014.